It was long suspected, and now Nuance has confirmed that their technology is indeed present in Siri, the digital assistant available on Apple's iOS devices. Nuance, a leader in digital speech recognition, has long been thought to have contributed technology to Apple's digital assistant, though neither company had confirmed that until today. Speaking at AllThingsD's D11 conference, Nuance CEO Paul Ricci finally confirmed that Nuance's technology is in fact a part of Apple's Siri. "We are the fundamental provider of voice recognition for Apple," Ricci admitted when asked whether Nuance was to blame when Siri doesn't understand requests. Ricci explained that Nuance does not handle Siri's artificial intelligence layers, only the voice recognition. Further, Ricci said that Siri has both embedded and cloud technology for voice recognition, but that the feature is overall a cloud solution. Ricci went on to note that Nuance doesn't do voice recognition only for Apple. In addition to the company's own Dragon dictation software, Nuance works with Samsung  presumably on that company's S-Voice Siri competitor  and other companies to develop voice applications on Android. 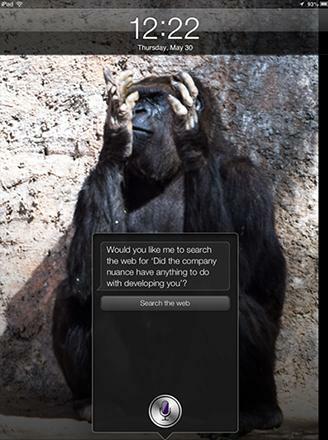 Nuance, however, is not involved with Google's speech-recognition effort, Google Now. That feature  recently brought to iOS and even more recently named in a Siri patent suit  is thought to have largely derived from Google's own voice recognition efforts and voice services. Ricci went on to describe the future of voice recognition in technology. The next two years, Ricci says, will see virtual assistants becoming much more robust and working across platforms. "The real problem," Ricci said, "is creating a virtual assistant that can understand what the user wants and take action based on anticipating those needs." Apple unveiled Siri with the release of the iPhone 4S, sending many of its competitors scrambling to develop a similar feature. Many of the larger Android manufacturers have done so in the time since, and Google Now has picked up much of the slack for those who haven't.